The prime purpose of yoga is to bring the body and mind in harmony. Hence, one has to find a time when both the body and mind remains at an equilibrium state to make the most of yoga practice. And, in yogic science, Brahma Muhurta or the morning time is considered to be the best time in this regard. This is the time when the mind remains at its highest state of calmness and the body at its harmonious best. Why is morning the best? Though sunset time also is a good time for yoga practice, it is mostly recommended for people those who prioritise on physical benefit through yoga. Moreover, one needs to ensure about at least 4 hours gap between lunch and evening yoga session, which may not always be possible in modern day busy schedule. The minimum of 4 hours gap is recommended to ensure that the food is properly digested. Doing yoga when food is not properly digested can have a negative effect. 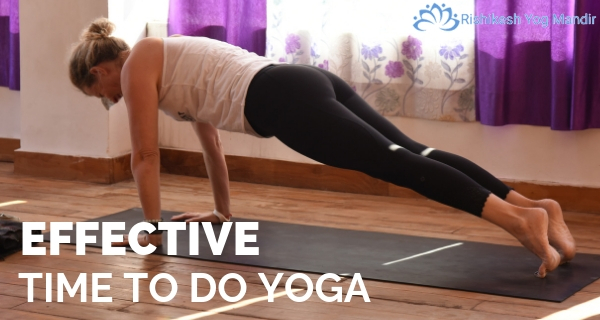 Considering the above aspects, the morning is certainly considered the best time to do yoga. Noon or sunset hours are not recommended for yoga practice as the chances of excessive sweating always remain there during these times. Excessive sweating may lead to dehydration state as well. On the other hand, human body temperature remains at the perfect state in the morning for doing yoga practice. As the body has already got enough time for digestion, it remains at its energetic best during these times. In concurrence, the enthusiasm also remains at the peak during this hour. Morning hour is thus the most recommended time for people trying powerful yoga poses. Beginners should always emphasise doing yoga during the morning hours only. When is it strictly prohibited? Yoga practice is strictly prohibited just before bed times. Specifically, the energetic asana or yoga postures should not be tried just before bedtime. This is neither good for the body or the mind. It’s the time when the body remains the most tried (and also the mind. Additionally, the stomach remains full, which should be avoided. Going to bed straight after doing yoga means nothing; it’s like wasting the whole effort. Keeping all these aspects in mind, morning time certainly becomes the most appropriate time for doing yoga practices. It would be even better to start practising at the Brahma Muhurta or just before sunrise or immediately after sunrise to make the most of it.